When Prince passed away, as a long term aficionado of the man’s music (even if he, himself was a little, shall we say, peculiar in his moods, desires and temperaments) I was saddened. I wrote about that at length here, including the albums that you really ought to buy if you don’t own any Prince music. At the time of his passing, I (along with everyone else) was left pondering what would happen to Prince’s legacy, and especially the (allegedly) “thousands” of tracks salted away in the near-legendary vault at Paisley Park. Some fans seemed to be of the opinion that if Prince didn’t want them released, they shouldn’t be, and I can somewhat respect that. Others wanted it all, and all at once, and I thought that was madness. If indeed there are “thousands” of unreleased Prince songs in various states of completion, that’s a lot of music to sort through. Prince himself wasn’t always the best judge of what his best material was, frankly. I long thought that one of the issues with the latter part of his career (much of which you can now listen to on streaming music platforms) was the lack of an external editor to gently guide the short purple one towards his best tracks and performances. I mean, who was going to stand up to Prince? The end result is that there’s a lot of great Prince music there… and then there’s stuff that perhaps should have stayed in the vault. Anyway, the Prince estate recently released the first real “new” Prince album since his passing. Yes, the newer WB “4Ever” album has “Moonbeam Levels” on it, but that’s one track amidst a greatest hits collection, not a whole album of material. Piano & A Microphone 1983 is a weird one, even by Prince standards. Apparently it existed as a single cassette tape at Paisley Park, and it’s one single long continuous take of Prince at his piano in (you guessed it) 1983. It’s a mix of “new” material, songs he had at the time that appeared on later albums (such as “Purple Rain” or “17 Days”) and some tracks not released officially anywhere. To complicate matters, there’s essentially four versions of the album. There’s the streaming version (available on Google Play Music, Apple Music, Spotify and Tidal), the standard CD version, the vinyl version (where there are no “tracks”, so it’s just as the cassette itself would have had it) and the Limited Deluxe Vinyl Edition, which combines the Vinyl and CD versions along with a photo booklet and liner notes. 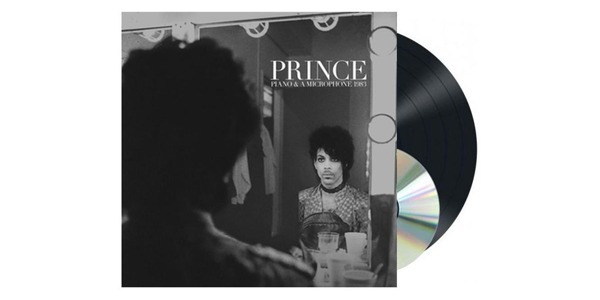 I like Prince a lot, but I’m going with the regular CD version, thanks. As a complete album — and this shouldn’t come as a huge shock — it’s not terribly cohesive or complete. That’s pretty much the point of releasing it, really. It’s more a way for the more dedicated fans to get a glimpse into Prince’s working methods with the benefit of some rather listenable material along the way. Bear in mind that this album contains a version of “Purple Rain” (short though it is) that predates the album version by a year, and while it’s a segment of the full song, it’s a lot of… well, I was going to say “fun”, but if there’s a mood that pervades the entirety of “Piano & a Microphone 1983”, it’s not fun. Prince is possibly having fun, because he’s essentially rehearsing, but just about every single song presented is melancholy in some way. It’s a pretty low beat album for the most part, but again, it was never built as an “album” to speak of. While the recording is a little rough in places — and it was never intended for official release — it really does show what a good performer Prince was, even in the pre-Purple Rain era. The songs may be melancholy, but there’s rarely a missed note, and Prince’s own vocals vary from that famous falsetto all the way down into earthy growls and then back up into pained shrieks precisely when he needed them to. Is it an essential Prince album and a glimpse into the long-promised vault? Or at least, the part of me that wants new finished Prince music hopes not, because if this is what the estate is choosing to release, it would seem to indicate that what the vault holds might be very choppy indeed; fragments of songs and ideas, and work we’re more familiar with in its finished form. That doesn’t mean it isn’t eminently listenable for long term Prince fans, however. It wouldn’t be the very first Prince album I’d buy, for sure, but as a quick peek into his creative world, and a very fun album of piano-led tunes, it’s genuinely fascinating.